Is it better to sell on Ebay or Amazon or should I have my own website? Each of the options, having a presence with Ebay, Amazon or having your own website, have advantages and disadvantages. Many of our customers have all three and and sell at different prices on each, which is something we will discuss later in this page. There are a number of points to consider before you can make a decision. Lets take each point in turn and compare both the good and bad in each option. If you decided to sell on Ebay or amazon you will find it relatively quick to setup and get online selling. However you do need to remember all the marketing you do is actually promoting Ebay and not your business and you will need to comply with all their rules and regulations. Some people see both Amazon and Ebay as detrimental to any business interested in building its own brand. It is true to say that Amazon and eBay are only interested in building Amazon and Ebay. They have no interest in helping you build your business (no matter what they say). At a moment’s notice, Amazon or Ebay could make an operational change that would render your business completely obsolete. As an example, you could be selling soap and they could decide to purchase a soap retailer and eliminate all 3rd party soap listings. Further, Ebay or Amazon could decide to ban the sale of whatever you’re selling? You’d be out of business the next day. Some people feel it's too risky investing time and money in building a business based upon the whims of another entity that has no vested interest in your specific success? It is true to say that if you disappeared, they probably would’t notice. But if they disappear so would your Ebay or Amazon business. You also need to remember that Ebay and Amazon are working as hard for your competitors as they are for your company. This generally means that you are usually competing on price. Some businesses feel that they cannot survive competing solely on price because it doesn’t give them chance to utilise any of their strengths in marketing, merchandising, or customer service. You also need to be aware that Ebay or Amazon can suspend your shop any time they choose. This may be because you haven't paid their fees, however what is worrying is that they have been known to suspend shops after receiving complaints from your customers, however unfounded these may have been. This could leave you in a really difficult situation where you have to convince Ebay or Amazon to reinstate your shop. If Ebay or Amazon choose not to reinstate your shop there is absolutely nothing you can do about it. Once you have been blacklisted by Ebay or Amazon, it is virtually impossible to start another shop with them. 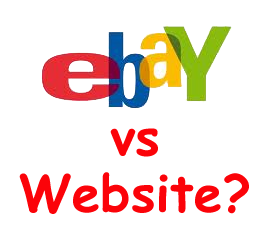 On the positive note Ebay does attract a great deal of web traffic which will bring a lot of visitors to your shop. They also offer both you and your customer some protection from fraud through their payment portal. With your own website you have total control over the look and feel. You can line up the colours and style with your stationary and press advertising. Once the website has been set up your only costs are the annual web hosting and domain renewals. You dont have to pay a fee or commission on each sale you make. When GCW design websites, we ensure that they are SEO optimised specifically to suit the goods/services you are offering, giving the site the best chance of appearing high on Google listings for your product/service. You can also run a google adword campaign to get things going speedily. Once your website is appearing in the listings the SEO can be tweaked accordingly so as to attain even higher listings if necessary. It is often the case that the website will perform well in the Google rankings without further SEO. The cost of running an adword campaign if set up correctly will probably cost less over all than the fees and commissions charged by Ebay. Domain name, this seems minor but is important. Having a website at yourname.com adds a level of professionalism to your business and also helps with marketing. Your own name will be easier to remember and can be advertised on your business cards and by word of mouth. Alternatively, you may be able to register a domain name based around your product line or services. e.g. airconditioners.com. An Ebay store domain name is more complicated and you would need to email someone a link if you wanted them to take a look at your items. Having a website with a proper web name shows the world that you are serious about your business and have invested both time and money in its future. With your own website you are able to not only sell your products but sell your company. You can talk about you customer care and after sales service which generally means you are not selling on price alone. All good sales people know that to sell something you must first sell yourself and your company. With your own website, it is you who decides how many products you place on the site, you are not limited at all, so your website can grow as your company begins to offer wider ranges of products / services. The method of taking payment for your goods/services is your choice, from using third parties, like paypal, your bank or using a card processing machine, or payments being processed online. We can offer advise as to which method will best suit your needs. We design websites to include easy to use Content Management Systems, which give you facilities that enable you to keep your website up to date, to add new pages as and when necessary, and add as many products as you wish. Image sizing is made easy for you, you simply upload the pictures and the software will resize to the optimum size for your website. Alternatively if you wish to make a "splash" page promoting a new product, you can design your own page and add to that as many images as you choose. This is something that is limited on an Ebay or Amazon website, where you have to work within their framework. To summarise you can if you wish do both. We have a number of customers who do have both and it works well for them. However, if you are serious about your business and are thinking long term with your business plans then a website of your own is really essential.